UPDATE (2014.04.15): The scores of the AMD FirePro W9100 are available HERE. When FP64 is enabled, the Julia FP64 score is this time correct and is around 1/3 FP32 (FP32 when FP64 is OFF). But when the FP64 is ON, FP32 performance drops by around 15%. In the freshly released GpuTest 0.7.0 (for Windows, Linux and Mac OS X), we can find a Julia fractal rendered in GLSL using double precision floating point (or FP64) numbers. The Julia FP64 test requires an OpenGL 4 capable GPU and the support of the GL_ARB_gpu_shader_fp64 extension. With current graphics drivers (Catalyst 14.2 beta for AMD Radeon and R319/R334 for NVIDIA), AMD Radeon GPUs are faster than NVIDIA GPUs: in FP32, the Radeon HD 7970 is +27% faster than the GeForce GTX Titan. And the gap is much more important in FP64 where the HD 7970 is 6X faster than the GTX Titan. If we look at this GFLOPS comparative table, the ratio between FP32 and FP64 is more or less ok for the Radeon HD 7970 (around 1/3 FP32 while the official/marketing ratio is FP64 = 1/4 FP32) but is meaningless for the GTX Titan: the official ratio is FP64 = 1/3 FP32 while in this test, the ratio is rather FP64 = 1/11 FP32. Same thing for the GTX 750 Ti (Maxwell) and for the GTX 680. In full HD 1920×1080 resolution, the ratio stays the same (FP64 = 1/11 FP32 for the GTX Titan, see HERE and HERE). the GeForce driver (the OpenGL part) is not optimized for this particular use case. there is something wrong in the GLSL code of the Julia fractal that slows down GeForce GPUs. 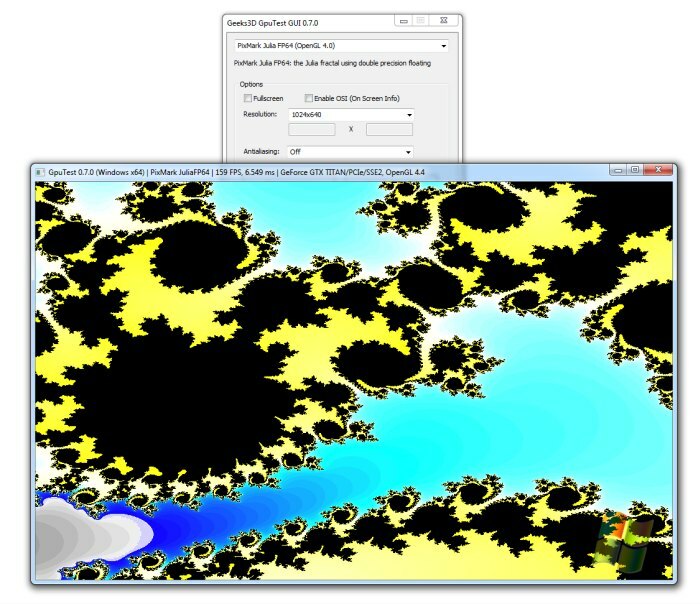 The Julia fractal used in GpuTest is based on this article. 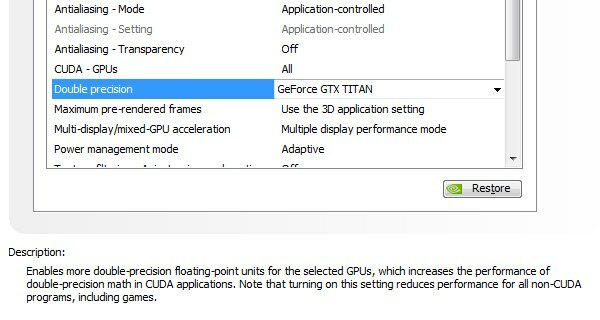 MAIN REASON: full speed FP64 is disabled by default on GTX Titan. FP64 can be enabled in NVIDIA control panel. I heard that there is some option in NVidia drivers that should switch between game performance\full FP64. Did you switch it? GTX Titan MUST be ALWAYS faster than any Radeon!! Therefore, please immediately remove your abnormal results because GTX Titan series are very expensive! In any Fermi card – FP64 is almost 1/4 than FP32 while Kepler – 1/11. The double precision switch is in the NVCP for the Titan! In any Fermi card – FP64 is almost 1/4 slower than FP32. Sorry for my mistake. GPU oc’ed to 800Mhz, using 2133MHz RAM. CPU oc’ed to 4.3GHz. @Fedy @lowenz: let me check that, I hope it’s a joke…. @Fedy @lowenz: I found this option! this is just not possible! Why does this option exist? I will do some bench and update the article. @JeGX: This option exists because when you turn it on, the driver downclocks the GPU to 850MHz and disable turbo to keep the TDP in check. So they decided to let the user chose what they prefer. Poor performance for Kepler because OpenGL hasn’t CUDA support but yes OpenCL. Very likely NV doesn’t care OpenCL and cancels to fix OCL issue. Therefore, please you must add support CUDA for your OpenGL 4 FP32/FP64. lol you should’ve known that Titan has two different modes switchable through driver, I’m surprised you didn’t, there are a lot of articles about it 😛 Game mode is for people who don’t need GPGPU and use Titan only for gaming. @Fedy: I will consider FP64 for my next benchmarks. Thanks for your explanations. Thanks for the link Stefan! @JeGX: Can you add CUDA support?? But CUDA support added is REQUIRED. Because OpenCL 1.1 performance is abnormal and is 1.5x slower than OCL 1.0, for NVIDIA only. Actually there should be Titan Black, same price and one additional SMX + higher clocks. I’m not paid by AMD nor by NVIDIA (that would be cool but it’s not the case). I’m totally independent. I don’t understand why we’re talking about OpenCL / CUDA here. I just did a simple OpenGL 4 (and from what I know, both AMD and NVIDIA support OpenGL) test with the FP64 feature exposed by this universal API. With current drivers, HD 7970 is faster than GTX Titan (in this particular test) and that’s all. solution but today I try to code cross-platform apps that work on NVIDIA, AMD and Intel GPUs. So if I had to code now a GPU computing benchmark, I would do it using OpenCL. And I’m sure (I hope!) that one day NVIDIA will release a super OpenCL driver. But I never said that I won’t code a CUDA benchmark. It would be even interesting to compare the same algorithm in CUDA and in OpenCL on different hardware (hummm, my brain is already thinking to a possible bench, aargghh!). Coding, releasing and updating a soft takes time (and more when it’s cross-platform) so be patient, and maybe one day you will read on Geeks3D a new about a new cuda benchmark… Good night! Great bench JeGX, as always. @blacksheep: Ok but GTX Titan (CUDA) would ALWAYS beat any AMD-ATi (OCL), if OpenGL will use CUDA because GeForce card continues get abnormal performance since the “poor” optimization of OpenCL 1.1 driver for GeForce. this is OpenGL FP64 test, not OpenCL so this is NVidia’s OpenGL driver issues, probably. @nuninho1980: I have no doubt that Titan is technically capable to do it, but seems that John Smith is right about the driver thing. YES, it has OpenCL! Because look “plugin_gxl3d_opencl_x64.dll” file in “drive-letter:\…\GpuTest_Windows_x64_0.7.0\plugins”. lol. If it was CL kernel it surely wouldn’t be “GLSL” and also would not require that GL_ARB_gpu_shader_fp64 particular extension. gputest alone probably uses OpenCL somewhere, but not in this test. It’s a pure OpenGL test (GLSL shaders with fp64 variables), there’s no OpenCL kernel involved in the rendering. The OpenCL plugin is currently used only with the GPU monitoring plugin to provide information for the GPU database.